Getting the most use out of your cabin undoubtedly will involve use during the cooler months of the year. Unless my 'O' Level physics is playing tricks, hot (warm) air rises, it therefore follows, the first area you should look to insulate is the roof. 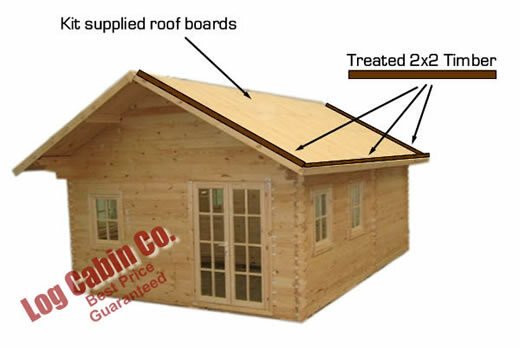 Construct your cabin according to the manufacturers instructions, including complete installation of the tongue and groove roof boards, but not the fascia boards for the gables. 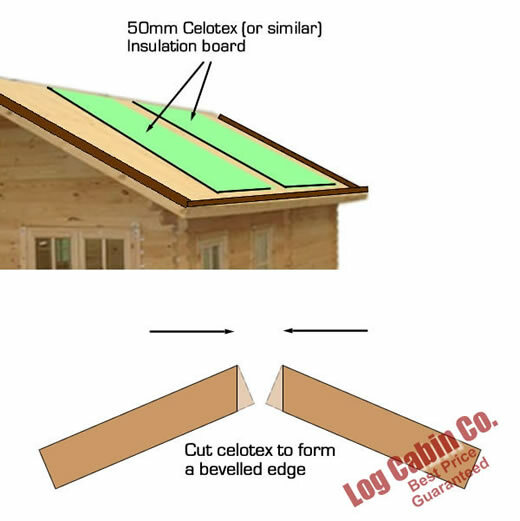 Attach the 2"x2" battens to the gable edge and lower edge of the roof. 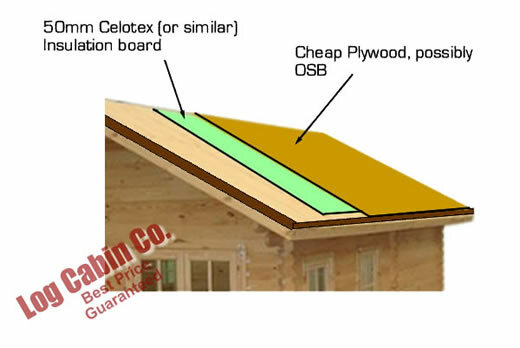 This creates an enclosure into which the 50mm celotex insulation board can sit as per the following diagram. Cut the celotex sheets to fill the roof area. Good practice is to bevel the top edge so that the reciprocal board from the opposite face creates a mitered joint and a snug fit between boards. Insulation board cuts easily with a general purpose saw, otherwise a sharp knife can be used to good effect. Note : Diagram shows gaps around insulation board - this is for demonstration only. You would position these tightly together without gaps to ensure uniformity of insulation across the roof. 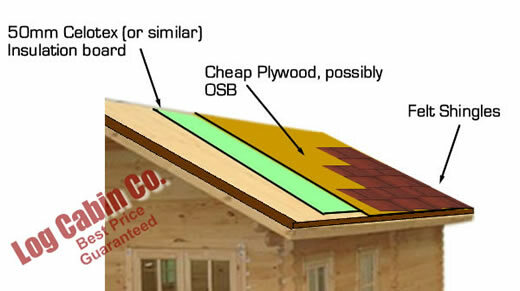 Cut sheets of 12mm cheap plywood or OSB (Stirling) board to cover the whole roof. Secure these boards by screwing though the plywood, insulation boards and into the roof joists beneath. Be sure that the screws are long enough to properly locate the roof joist and that the screw is in the correct position so as not to miss ! Finally, apply the roofing material over the top of the plywood using the approved method of application according to the type and style used.